There’s a prevalent misconception that once someone becomes a parent, they become an ineffective and unmotivated worker. Perhaps it’s based on the opinion that a working parent has a lot more on their plate, they are more distracted, or they care less about the services they provide because family becomes their top priority. This misconception is just that – a misconception, a.k.a. a view that is based on a faulty understanding. I’m living proof. I am a New Jersey family law attorney. I co-own a law firm, Ruvolo Law Group, LLC, with offices in Morristown and Hackensack. I am also the mother of 2 sets of twins who are 16 months apart. Yes, 2 sets. My oldest set is 4 and my youngest is 3. As a professional, I don’t hide the fact that I’m a double twin mom. My office is riddled with pictures of my kids. If you walked in my office and didn’t know me, you might think I have an unhealthy obsession with Anne Geddes photos. In reality, those are photos of my kids – ALL of them. I conduct my initial consultations in my office. When people first walk in, it’s impossible not to notice the pictures of my children. Most of the time, when a prospective client discovers I have two sets of twins a year apart, they look at me in awe. They’re excited to know about my double twin journey and I openly share my stories with them. After all, they are about to share the most intimate details of their life with me. They deserve to know a bit about my personal life. Decide for yourself. 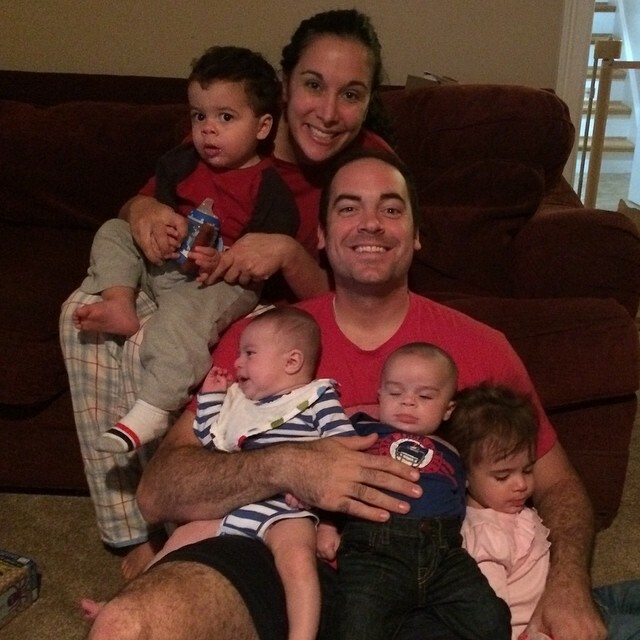 Here are some reasons why being a double twin mom makes me a better family law attorney. No client, spouse, attorney or judge can scare me. You want to know what’s scary? Holding two 8-month-old infants while building two more in my body. Now that’s scary. I’ve handled 4 babies crying at the same time on little-to-no sleep. A self-proclaimed big shot attorney evokes no fear in me. I can handle a big ego, a meanie, or a loud mouth with ease. You think the courtroom is an unnavigable circus? Spend 5 minutes in my house with 4 toddlers who are planning to overthrow the adult hierarchy. So, when it comes to being an attorney, I’ve got this. Trust me. 2. I always have a strategy in place. Life is constantly moving and because of that, I’m not comfortable with stagnancy. The life of a double twin mom is never dull or predictable. One day, I have my “mom schedule” down pat like a well-oiled machine. All 4 kids are healthy, happy, clean, well-fed, and go to bed on time. The next day, I have 4 sick kids. The “plan” is scrapped. When that happens, it’s not the end of the world. I have a backup plan. Life continues to move forward because I’ve planned for the occasional hiccup. Your case is no different. If one strategy doesn’t work, you should have 5 more lined up to keep your case moving. No case should ever remain stagnant unless and until it’s settled or tried in court. In 16 months, I’ve built 4 beating hearts, 4 brains, 8 arms, 8 legs, 40 fingers, 40 toes and 1,080 bones… in my body. At one point, I had 4 children under the age of 2, while running a business. I can certainly settle your divorce case or bring it to trial, however complicated you may think it is. 4. I’m conscious of the financial and emotional expenditure. I have a family. I’m extremely aware of the financial toll a change to your family has on your and your children’s future. Although of a different nature, I know the fear that is elicited within you when life throws you a curve ball. The key to minimizing the impact is to be efficient and productive in your response. You must establish goals at the inception of your case and tailor your positions in a manner that will achieve these goals. I begin every case with familiarizing myself with the facts and my client’s goals. Typically, once I am comfortable with the nuances, I immediately draft an agreement that aligns with these goals. I do this even before negotiations commence. Why do I put the proverbial cart before the horse? Because 98% of cases will end with an agreement. I want to ensure I have a working draft ready so that when a settlement is finally reached, I can tweak it, review/revise it with my client, and get it to the opposing party as quickly as possible. Once a settlement is reached, weeks shouldn’t pass before the first draft of an agreement is introduced. This stagnancy leads to impatience, overthinking, reneging on terms, forgetfulness, letter-writing campaigns, and more animosity – all of which result in more money spent by the clients. As I do in my own personal life, I perform financial check points in my cases from time to time. Alongside my client, I review the financial and emotional expenditures that have been exhausted to achieve my client’s goals. Are you spending $1,000 in counsel fees to get your ex to reimburse you $500? If so, is the future financial savings worth it (i.e. showing your ex that you refuse to be his/her creditor, thereby ensuring that you are timely reimbursed for the thousands of dollars you will outlay in the future)? Your attorney should always perform these financial check points with you and be conscious of the return on your investment. 5. I look forward to going to work. I literally run out of my house and into my car in the morning to escape the madness. Please don’t misunderstand me. I love my children. I love being a mom. Even so, I enjoy the break from being buried in Dr. Seuss books. My sanity hinges upon taking a daily sabbatical from a house filled with dozens of painfully loud musical toys with alarms that sound off when you accidentally tap them with your toe. It takes an unbelievably patient and brave person to be a stay-at-home parent. Although I love motherhood, I need to detach from my home life to survive it. As a New Jersey divorce attorney, it’s incredibly rewarding to assist someone in closing a painful chapter in his/her life and then helping them plan for a peaceful, successful future. It gives me a break from juggling 4 active kids so that when I am with them, I have focused, quality time with them. 6. I work really, really hard. I am a daughter of two working class immigrants. I wasn’t born with a silver spoon – I had to forge my own. I now have 2 sets of twins, a working husband, and a successful law practice. 7. I surround myself with people I trust. They say it takes a village to raise a child. Well, it takes a small army to raise my brood. I am extremely fortunate to have the trusted and reliable help of my parents, in-laws, family members, and close friends. Ruvolo Law Group is no different. Our team consists of passionate, sensitive, and dedicated professionals who can reliably assist you in weathering the day-to-day uncertainty of your tenuous situation. Our staff is comprised of people I trust to care about your case as much as I do. Life is unpredictable. Five years ago, I never imagined where I would be today. I now understand what it’s like to be a parent, spouse and business owner. I know the anger and resentment that is evoked when someone questions your ability as a parent or the choices you have made for your family. You will always know what’s best for you. Most importantly, you know what’s best for your children. I respect that and will advocate for it within the bounds of the ethical and moral code I must obey. Like you, I am human and we’ve all made mistakes. I do not regret raising two sets of twins while practicing family law. Likewise, your choice to have a family and change the framework of that family should not be a mistake you regret. When you decide to ignite that evolution, think twice about the misconception of retaining the lawyer-parent (like me) to lead you on this path. Hopefully, those fears have been laid to rest (like all four of my kids this evening…finally). Melissa M. Ruvolo, Esq. is a partner at Ruvolo Law Group, LLC in Morristown and Hackensack, New Jersey. She is a member of the New Jersey Bar Association and practices exclusively in the area of family and matrimonial law. She is also a family law mediator and trained Collaborative Divorce attorney. She is certified by the New Jersey Supreme Court as a Matrimonial Law Attorney, a title granted to only 2% of attorneys in New Jersey. To schedule a consultation with an attorney at Ruvolo Law Group, please visit the firm’s website or call 973.993.9960.